Charles Camoin joined the École des Beaux-Arts in Marseilles at the age of sixteen, while at the same time studying business. After he won a prize for one of his drawings, his mother encouraged him to go to Paris and to join Gustave Moreau's studio. There, in 1898, he coincided with Manguin, Marquet, Matisse, Puy and Rouault, the artists who would later make up the nucleus of the Fauve group. After the death of Moreau that same year, Camoin often painted in the streets of Paris in the company of Marquet. In 1900 he was called up and moved to Arles, where he painted some famous locations depicted in the works of Van Gogh and Gauguin. The following year he was sent to Aix-en-Provence, where he befriended Cézanne, whose example would moderate his colourist effusions. From 1903-1904 onwards, Camoin took part in the Salon des Indépendants and the Salon d'Automne. In 1904, he also met Monet in Giverny and had his first individual exhibition at the Galerie Berthe Weill. Camoin presented several works in the famous cage aux fauves of the Salon d'Automne in 1905, although the critics pointed out his chromatic moderation compared with the works of his partners, resulting from an intuitive and non-systematic approach to the postulates of fauvism. His Portrait of Albert Marquet (1904-1905), considered his masterpiece, dates from that period. The progressive exhaustion of Fauvism and the appearance of new artistic currents, such as Cubism, plunged Camoin into a deep artistic crisis that would lead him to destroy more than eighty paintings from his "black period" in 1913. That year, Camoin travelled to Morocco with Matisse, where he recovered the joy of painting and the brightness of his palette. 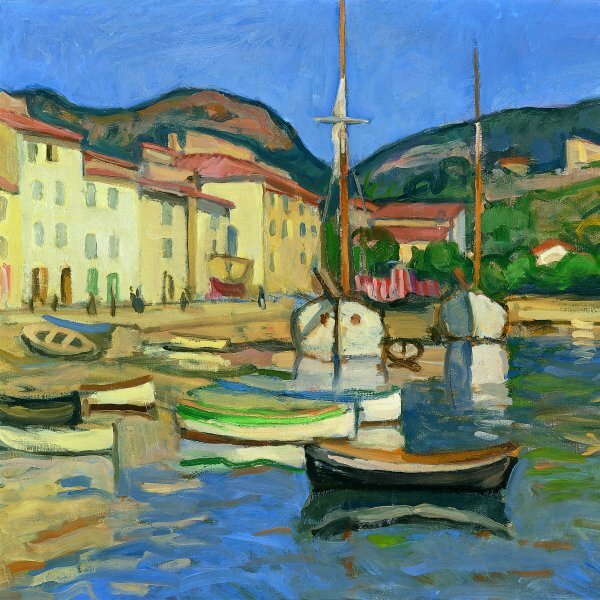 After the First World War, Camoin visited Auguste Renoir's workshop in Cagnes-Sur-Mer, and from then on he developed a more colourist and voluptuous style. In 1920, Camoin married Charlotte Prost (Lola). They lived together in Paris and Saint-Tropez, where Camoin continued painting landscapes, figures and still lifes. He died in Paris on 20 May 1965.